There is no denying that this is a fast-paced world. Stressful and demanding jobs, erratic work hours, rush-hour traffic… in short, people no longer have too much time to spend in the kitchen, yet they want a healthy and well-balanced diet that will enhance their productivity. 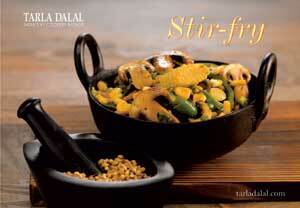 For those of you in search of such healthy alternatives, stir-frying is the best option. Stir-fries score high on the health factor. Since they are cooked fast and with very little oil, there is minimal vitamin loss. The nutrients and flavours of the ingredients are retained just as the colour and texture are preserved. Stir-frying is not only a healthy method of cooking but also a very creative one, as it allows the use of a variety of ingredients like vegetables, fruits, paneer, tofu, sprouts etc. and various flavouring agents like sauces, ginger, garlic etc. Almonds, peanuts, just use your imagination and toss in whatever you think will taste good! There really is no limit to what you can do with a wok, and an assortment of vegetables, spices and sauces. The collection of well-chosen and well-tested recipes in this book is just right for you to kick-start a new, healthy and tasty cooking routine. We have tried to present an eclectic collection of recipes in this book, including soups, rice, noodle and vegetable dishes, Indian, Thai and Chinese recipes, all based on the stir-fry technique. Delight in the simplicity, health and flavour of dishes such as Tum Yam Soup, Chilli Pineapple Stir-Fry Rice, Kashmiri Fruit Stir-Fry Rice, Vietnamese Stir-Fry Noodles, Bean and Corn Stir-Fry, Paneer Khurchan, Lemongrass Vegetables, and Crispy Lotus Stem Honey Chilli. What are you waiting for? Step into the kitchen and toss in and stir up a delightful fare, in a jiffy, for your family right now!